QuasarDragon: Too Early for a Clever Title for the Free Fiction. Too Early for a Clever Title for the Free Fiction. Sunday morning begins well with new fiction at GigaNotoSaurus and the latest issues of two fantastic free ezines, Indian SF (pictured at left) and Mirror Dance. 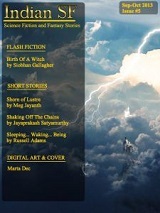 There's also flash fiction, an audio children's fantasy, and some classic pulp noir. More to come today, of course. • At GigaNotoSaurus: "Small Strange Towns" by Rashida J. Smith. "When Nana left Ben the house and acreage it took him a full week to remember he’d spent much of his childhood in Strange. A month after the funeral he missed and between jobs, he decided the Saab could use a good road trip. Time to figure out why he could barely recall the closest thing he had to a hometown." "Yama likes his elaborate rituals"
"I have drunk deeper of the waters of truth"
"Maybe something new had escaped, taken up residence this summer in the flowerbeds"
Now Posted: Mirror Dance - Autumn 2013. • "A Concerto and Fugue" by Amy Holt. Fantasy. "Mr. Humphrey stands to take his turn on the platform stage. Absently, he rubs the sideboard of his wooden doppelganger. He arranges his frail bones and slipshod tendons in the performance chair and, after a sigh, begins." • "The Boy and the Dragon" by Ann-Marie Martino. Fantasy. "Now, this dragon was a young thing, a fractious male, but he wouldn't bother waking up to eat just anyone, and, in truth, found humans rather tiresome and not all that appetizing." • "A Mixed Catch" by Jess Hyslop. Fantasy. • "Sadko" by Edward Ahern. Fantasy. "In the old days in Novgorod there was a boy named Sadko, strong, blue-eyed and curly-haired. Sadko was so poor that he had not a kopek except for what people gave him to play on his dulcimer for their dancing. He was not always happy, for it is dull work to always play while other people dance." • "The Unicorn Game" by Alicia Alves. "It’s not that I don’t love him. I do, in a way. I just don’t want to marry him. Of course, what I want doesn’t matter. In Albion, all of its daughters must marry and so shall I." • "A Hollow in the Moment" by Mike Phillips. "Though he could still hear him as he crashed through the thick undergrowth ahead, Jason wasn’t exactly sure in which direction his brother had gone. He was afraid of getting too far away from camp and getting lost in the mountains." • At Every Day Fiction: "Last of the Damned" by Harding McFadden. Fantasy. • At Indian SF: "Birth Of A Witch" by Siobhan Gallagher. "Purgatorium" by David R. Cravens. "The Throne, Restored" by Shelly Bryant. • At Internet Archive [LibriVox]: Davy and the Goblin by Charles Edward Carryl. Children's Fantasy. "Eight-year-old Davy reads Lewis Carroll's novel Alice's Adventures in Wonderland and begins to get very sleepy. Suddenly a goblin appears in the fire and takes Davy on a 'believing voyage' much like Alice's own adventures in Wonderland, where he meets many characters from fantasy and literature" Text Here. • At Online Pulps! : "Borgia's Barbecue" by Ted Coughlan. 1943. "Hand of Double Doom" by Vance C. Criss. 1937. "The Fifth Guest" by Norman A. Daniels. 1948.